This is going to seem like a rant, and maybe it is! I WILL NOT apologize! 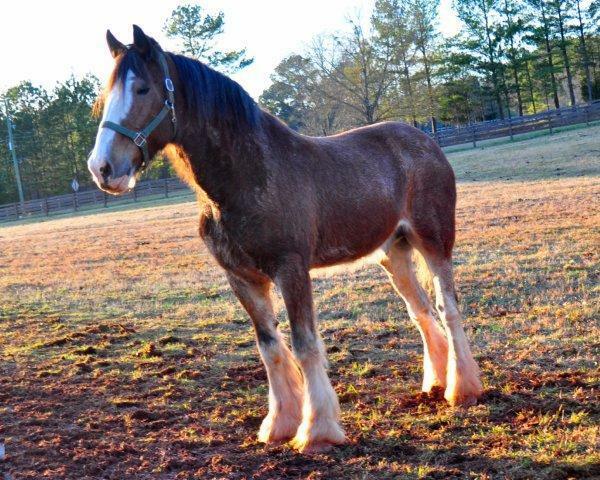 I get phone calls about once a week asking for information on how to adopt a Clydesdale. I know the inquisition is because there is a kind person on the other end of the line that really wants to "do a good thing." But sometimes it's someone that thinks rescue means "cheap" and with a Clydesdale this will never be the case. I'm a firm believer that the cheapest part of horse ownership is the purchase of the horse. 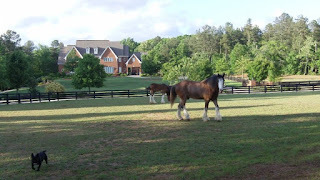 Clydesdales can often double and triple typical expenses so listen carefully. This beautiful, big hearted soul on the phone is in for a heck of a long journey. I spent a lot of my teenage years touring the local horse auctions. We lived near Amish country where I grew up and I had the amazing experience of helping a friend of mine locate riding prospects that she would rehab and re-sell to help support her own horse addiction. I was a horse crazy kid and I'd do just about anything to be near them. What this experience taught me was that there are a lot of unscrupulous folks that hang around sale barns and there is also a bit of money to be made if you don't have a conscience. There are also a large group of folks that work tirelessly to help a few of these horses find loving homes. The former is usually the biggest group and here is where my rant starts. I love Budweiser! I love them for so many things. They are huge contributors to our Education Foundation and they support our Clydesdale Breeders of the United States tirelessly by way of donations and actual hands on support. A member of their organization is often on our Board of Directors. Budweiser has also made our beloved Clydesdale one of the most widely recognized horse breeds on the planet. I don't know very many folks who don't know what a Clydesdale looks like and a few of the other draft breeds get pretty salty when you call their beautiful Belgian or Percheron a Clydesdale. This is a huge reason why our horses very seldom end up in true RESCUE situations. There are millions of folks that will happily re-home a Clydesdale and pay a bit to do so. So they don't often make it as far as a meat buyer. Now, unscrupulous auction houses will often travel up into the Northeast searching for an inexpensive (usually $2500 and under) Clydesdale horse that maybe got older, maybe got skinny or maybe can't be bred anymore and haul that beautiful horse to their auction house. I've seen them up in Canterbury and I've seen them as far South as Bastrop. Here is where the fun starts! That auction house will start plastering the Clydesdale's photograph and sob story all over Social Media telling these lovely folks behind a keyboard that this horse is in danger of shipping to Mexico to be meat. C'Mon now, REALLY? But, anyway! They put a bail amount on their head as high as $5000 and start fundraising. Seems OK right? What's $5000 when it saves a life! Well, maybe, but this horse was never in danger of shipping in the first place. So basically, what just happened was, this horse sold to an unsuspecting and uneducated buyer for as much as a sound, registered young prospect and it's probably got something going on or it wouldn't have been there in the first place. I usually get a call 6-9 months later detailing how many thousands of dollars they've spent to rehab this horse and they just cant financially and emotionally do so anymore and they end up here or they end up with Candace Taylor in NE GA.
Basically what I'm trying to warn you about is that there is NO SUCH ANIMAL as these kill pen Clydesdales that you see on Facebook. They ARE NOT EVER going to ship for meat. Don't support the auction houses. They will just take your hard earned money and find another Clydesdale just like the one you saved with the money you spent. Our Clydesdale horses are gorgeous and sweet and easy to scam people with. Here is a real life rescue story of a Clydesdale Gelding named Teeny. He was our resident Grade Gelding that was rescued by the GA Dept of Agriculture from an inner city carriage company in Atlanta. He was starved and had literally no foot left due to poor care. Two of his mates didn't make it out alive. After a year of dedication from the good folks at the Georgia Department of Ag he bounced back and came to be with us. His rehabilitation wasn't without it's struggles. His feet were never right and he required special shoes and every 4wk farrier care. He was riddled with pastern dermatitis (aka Scratch) or honestly Chronic Progressive Lymphedema by this time. He also had a hard time breathing in the heat of summer. He was also very arthritic after pounding the hard pavement of the Atlanta streets for a number of years. We were happy to provide this care and could afford to. His monthly veterinary and maintenance bill totaled around $2000 per months. This is a house payment for a lot of folks. I'm disclosing this to educate that truly rescuing a Clydesdale can be very expensive. We loved Teeny and he started it all again for Mark and I after a 6 year break from Clydesdales. We know they can't all be show horses and breeding stock, but we love them all the same. Teeny was a great pleasure gelding and he loved to ride the trails. He also kept the young ones in line for us. They all have a story and his was long. We recently found out that he was born in Canada and only spoke French. He was born "Barney" but he's our Teeny and we loved him. RIP big guy! You'll always be with us. If you know of a Clydesdale or draft horse that is in a sticky situation and needs a place to land for love and support, please contact us. Even if we don't have space at our farm, we will try to find a loving environment where the Draft can get the care they so desperately deserve.